I will admit I am not a fan of the tags because it's like those one forwards of getting to know you emails when you already know the person. But I figure this one isn't so bad. 4. Kelly is my favorite person in the whole world. He is so cool and he doesn't even have to try. 6. I was a tomboy when I was little. Still kinda am. 7. Motorcycles, any nice car, drives me crazy in a good way. 8. My favorite season is Fall. 9. I broke my left pinky toe when I was four. 10. I like the Indigo Girls, I even went to their concert with my sister who was pregnant at the time. 11. I want to have kids one day, but am scared I will be a crappy mom. 12. Breakfast at Tiffanys is one of the most boring movies I have ever watched. I put that because I just finished watching it. 13. I love being challanged. 14. Sudoku's puzzles keep me up at night because I keep doing them. 15. I hate smelling like food. 16. I have never worked in a food establishment. 17. The smell of dog pooh makes me gag. 18. I love the smell of my own perfume. Weird, kinda. 19. I hate being alone. 20. Photography is my new passion. 21. I am scared of failure. 22. I love to write, got a degree in it, but I don't want to write for a living. 23. My favorite candy is those gummy strawberries from black forrest. 24. I hate the smell of peanuts. 26. I co-own a Britaney Spears cd, before she became a whore. 27. I have a short temper. 28. Smokers should be shot, they are going to die anyways. 29. Politics piss me off. 30. I love fires, camping or in the fireplace. 31. I love being the center of attention except on my birthday. 33. Stephenie Meyer is my new idol because she can write about vampires and make it interesting. 34. I want to become a spin teacher. 35. I am scared of dying. 36. I tried to make a kite out of a plastic sack once. I tied it to our plum tree. My told me to take it down because it looked tacky. 37. I would not want to relive any part of my life. I'm all about looking forward. I figure the best part of my life is still to come. 38. I love playing the piano, but get crazy nervous to play infront of anyone. 39. I had an article published when I was in high school. I have a pen that proves it. 40. I keep all the notes my friends wrote me in high school. I have every letter and card anyone has ever written me. 41. I cheated on a spelling test once. 42. The Grudge scared me so bad I had to sleep with the lights on. 43. My fingernails go purple when I get cold. 44. I regret not contuing to play soccer when I was younger. 45. I have many ambitions but am scared I will never accomplish them. 46. Lived in Utah my whole life and have never been skiing. Ever. 47. I like the Harry Potter movies, but refuse to read the books. 48. I ran away from home to my friends house, but my dad came and got me later that night. 49. Saturday mornings are my favorite time of the week. 50. It's hard to let people get to know me. There you have a list of things about me. I will make Kelly post one. I'm sure he will love it. I did it!! 13.1 miles baby, ya!! 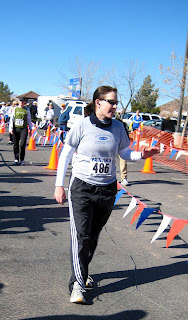 I had trained for three half-marathons and finally ran one. You may ask, is it worth it? Well looking back on running in 20 degree weather at night, aching joints, giving up my Saturday mornings to run and paying to run in a race, ya it was worth it. And if you don't understand that, then you must not be a runner. Just kidding I am sure there is something in every one's life they would put that much effort and time into to achieve. 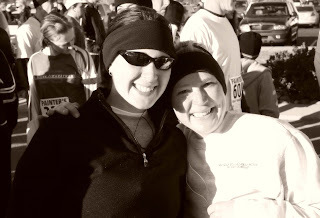 My sister Meredith and I started training in October. 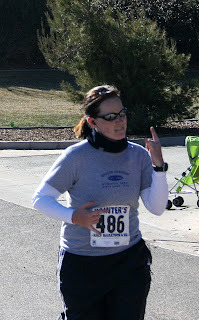 I got sick with a nasty sinus infection three weeks before the race so I missed a long run. I did my best and pulled a 2 hour and 50 minute finish time, Mer pulled a 2 hour and 27 minute time. Go Mer!! 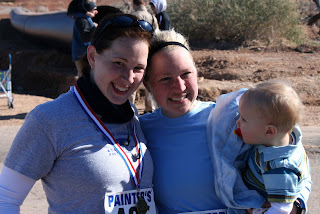 This was both of ours first half- marathon. I stayed with her for about the first 3 miles and then she took off. Somewhere in between mile 1 and 2 there was these two horses running in their pen and one got so excited at all the comotion, he jumped over the barbed wires and started running through the neighborhood. We laughed the rest of race. Don't worry we drove by later and the big fella was back in his pen. 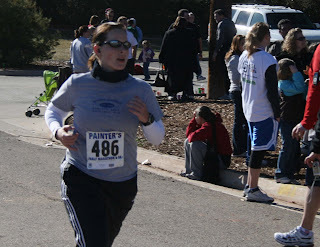 The rest of the race was just a struggle to keep my head in. I made some friends along the way, but I had to beat them to the finish line so I left them after a while. I thought my knees were going to give out at mile 10, but I had to keep going. Luckily I only had three more miles to go. I finished as strong as I could. Now I am done till the next race. We got into St. George Friday night, picked up our packets and then ate a huge carbfilled dinner at the Pizza Factory, I loved it. I ate so much bread. Saturday morning the race started at 9 a.m. After the race I enjoyed a freezing cold bath, and then a long soak in the hot tub. We just hung out the rest of the day and headed home Sunday morning. Besides the long a-- run in between it was a relaxing weekend. I included some pics of the race. Mer was sneaky when she came in so everyone missed taking pictures of her coming in. Thanks to my family for coming to support me. Thanks for the flowers Pam and Bret, for thinking of me. To Mer for putting up with my whining and training with me. Also a big shout out to Kelly for believing in me and not letting me give up. 9. "it's just up the canyon"
I didn't make a resolution this year mainly because I slept through midnight on new years eve. (i was sick ok). But I have an idea of what I want this year to be. I want to quit doing jobs to just get by and to start doing what I love to do. I want to finally run a half-marathon. I started training for two but never ran them. I want to stop being mediocre and start being great, to live up to my potential. Well, since people only really care about pictures, I have posted some of my favorite pictures I took this year. Most of them are of Kelly and Harley. Go figure.